Would you pay $2,999 for this 12 gauge Arrieta SxS shotgun? Do you love the idea of ordering a bespoke shotgun? A lot of people do. But there can be a downside to a having a shotgun custom made just for you: After all your anticipating and money spent, what you specified on paper may not be what arrives at your door. That’s one reason I like used doubles. With a used shotgun, you know what you’re getting (at least once your gunsmith has had a chance to look it over). Even if you buy a side-by-side or over-under online, you should be able to get your money back in a couple of weeks if there’s a problem. So you’re thinking about “bespeaking” a 12 gauge Spanish sidelock, I would take a long look at the Arrieta you see here instead. I’m not sure if it’s 557, a 570, or something between. But whatever model it is, it sure looks like a good deal for $2,999 – especially when you consider that a brand new 12 gauge 557 costs $4,999. 12 gauge Arrieta Double Barrel Sidelock Shotgun: This elegant gun is one of Arrieta’s best guns! It’s a 7 pin Holland & Holland style lock. It has has a case colored receiver and is beautifully engraved with ultra fine scroll engraving, gold plated removable sidelocks, double trigger (front hinged), auto ejectors and so much more. Notice all the details like N/S screws, the beautiful case color, the fit of wood to metal and so on. 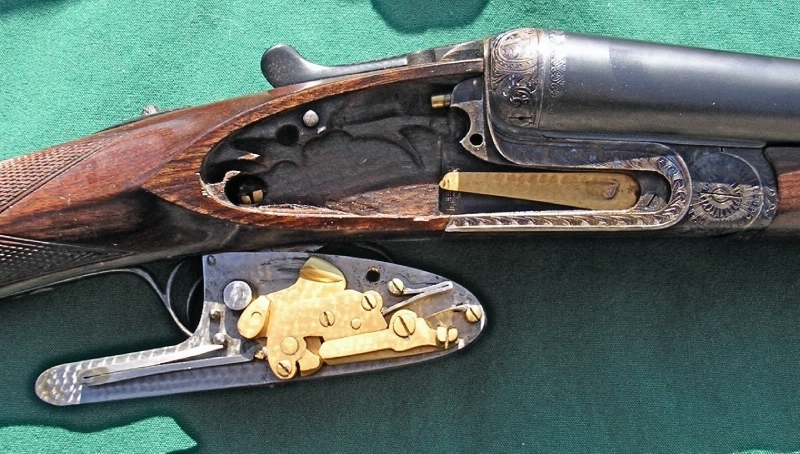 This particular gun is “as built” with the exception of an added pad (owner is tall), no wood was cut off. It is a 12 bore choked light modified and improved modified. 6 pounds 12 ounces. Stats: LOP 15″, BBls 27&3/4″, DAH 2&1/4″, DAT 7&1/4″, OAL 45&1/4. That is more than a great deal – that is a steal. The 500 series Arrietas were built with 5-pin locks, and the 7-pin actions were reserved for their higher end 800 series guns (with the exception of the round body 871). A new 7-pin 800 series Arrieta will cost well over $10k. That said, the Spanish makers have a fluid sense of gun “models” – many bespoke Spanish guns are an amalgam of features from different models – this gun seems to fit that pattern. The inletting looks to be well done (based on the limited photos) and the gold plated lockwork is further evidence that is gun was intended to be a high quality gun. It is an older gun based on the serial number – many think the older guns were better made (with the possible exception that some of the steel internals could have softer steel). At this price, that seems like a risk worth taking. I forgot to mention that the 5-pin locks use coil springs for the main spring, while the 7-pin locks use a v-springs. Thanks for the info. I hope someone snaps this gun up. I posted a link to your blogpost on the Spanish Gun Forum – free marketing for you and a good deal for them to look at. Cool. Thanks for the help. One of the guys on that forum should snap up this gun. If you’re still looking for info, let me know. Sorry for the late response. My system has been messed up, and it just notified me of your comment. Yes Gregg I am still interested on any information you might supply for the sale of the Arietta sxs shotgun I have for sale on gunbroker. Serial number 262-08, excellent condition, Furstenberg floral pattern, case and all accessories . I need a good ball park idea on price to be fair on the sale. Thanks Frank. OK. What’s the listing # on Gunbroker? I’ll take a look at it.